Big concert held at Seven Arches Hotel on Mount of Olives in east Jerusalem draws thousands of revelers. Pictures inside. Thousands participated in a joyous concert marking the anniversary of the death of Rabbi Haim Ben Atar, known to Jews the world over as the "Holy 'Ohr Hachayim'" after the book he authored, the "Light of Life". The celebration was held in the Seven Arches hotel, which is located on the Mount of Olives in Jerusalem - where the 'Ohr Hachayim' is buried - and featured musical performances by singers Haim Yisrael, Yaniv Ben Mashiach and Lior Elmaleh, accompanied by a large orchestra. Among those in attendance were Sephardic Chief Rabbi Yitzchak Yosef, Interior Minister Arye Deri, Religious Services Minister David Azulay, MK Miki Zohar, Religious Services Ministry Director-General Oded Plus, Deputy Mayor of Jerusalem Dov Kalmanovich, Jerusalem City Council Members Tzvika Cohen and Moshe Leon, and Head of Jerusalem Cemeteries Council Rabbi Hillel Horowitz. The thousands of concert-goers were conveyed to the event - held on the ancient Mount of Olives in the eastern part of the city - in buses surrounded by security organized by the concert producers, going from the Shmuel Hanavi street in central Jerusalem to the stage in orderly fashion. Dozens of security personnel were spread out over the pickup area and the site of the event. Jewish communities in and around the Mount of Olives have often been targeted by Arab extremists. Rabbi Hillel Horowitz, head of the Cemetery Council, emphasized the importance of an event that brought many thousands to the Mount of Olives, site of the grave of the Holy 'Ohr Hachayim'. "This concert, that combined tremendous joy with deep emotion, was produced with great professionalism by the Jerusalem Cemetery Council in cooperation with the Department of Torah Culture of the Education Ministry, with great emphasis on achieving the highest quality of experience, employing giant lighting features and giant screens, among other things," said Rabbi Horowitz. Just the previous night another large event was held at the site. A big "Hazzanut" (cantorial music) concert, featuring some of the world's leading cantors, choirs, and the Jerusalem Symphony Orchestra. 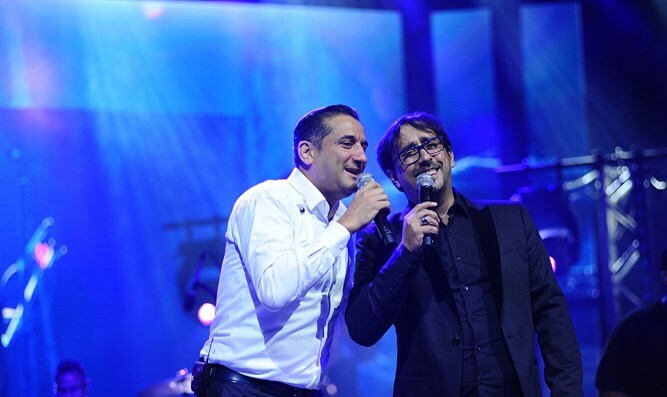 This event also attracted many thousands of Jewish music lovers.